Crafted from solid hardwood, the Victoria's Tradition Nightstand is a stunning example of authentic Amish craftsmanship. 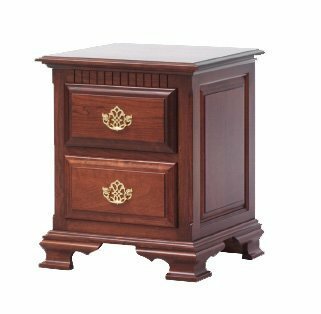 With the raised panel design, dental molding and Chippendale feet, this nightstand will serve as the perfect compliment next to your Colonial style bed. With two full-extension dovetailed drawers, you will have plenty of room to store your bedside essentials, with easy access to all your items, when you need them. Add the optional under-mounted glides, that provide a beautiful floating drawer look that also offers a soft-closing mechanism, ensuring a quiet and complete close, every time. The aromatic cedar drawer bottoms are the icing on the cake, giving you the beautiful scent of natural cedar wood, while drawing excess moisture from your drawer. Customize your new Victoria's Tradition Nightstand by choosing the perfect hardwood, finish and hardware to compliment your bedroom suite! Questions? Please call one of our Amish Furniture Specialists today to answer your questions about the Victoria's Tradition Collection. We offer stain samples for all pieces and would be happy to help you start your order by phone. Toll-Free (866) 272-6773.